Powerful und persistent without limits. Versatile chain for extreme offroad use. 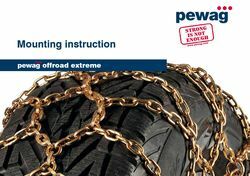 Where the road ends, pewag offroad extreme knows no limits and gets you safely over any terrain in the woods and to the highest peaks safely. 235/75‑17.5 235/85‑16 245/80‑16 265/60‑18 265/65‑17 265/70‑16 265/70‑17 265/75‑15 265/75‑16 275/45‑21 275/60‑17 275/60‑18 275/65‑17 275/70‑16"
205/75‑17.5 215/80‑16 215/75‑17.5 225/70‑17 225/65‑17 225/65‑18 235/55‑18 235/60‑18 235/65‑17 235/75‑15 235/70‑16 255/60‑16"
195/85‑16 205/65‑17.5 205/75‑16 215/60‑17 215/65‑16 215/70‑16 215/75‑15 225/55‑17.5 225/60‑17 225/65‑16 225/70‑15 235/60‑16"
205/70‑17.5 205/80‑16 215/80‑15 215/75‑16 225/60‑18 225/70‑16 225/75‑15 235/50‑18 235/55‑17 235/60‑17 235/65‑16 235/70‑15 245/60‑16 255/50‑17 255/55‑16 255/60‑15"
215/85‑16 225/75‑16 225/75‑17.5 235/65‑18 235/75‑16 235/80‑16 245/70‑16 245/70‑17 245/65‑17 245/75‑16 255/50‑19 255/55‑18 255/60‑17 255/60‑18 255/65‑16 255/65‑17 255/75‑15 255/70‑15 255/70‑16 265/65‑16 265/70‑15 275/55‑17 7.50‑16"
195/75‑16 205/65‑16 205/70‑16 205/75‑15 215/70‑15 225/60‑16"